The Meisner Law Group P.C. is pleased to announce that Joyleih has fulfilled her training program and is now a certified “Legal Beagle” with the firm. Her principal activities will be to assist in legal research and writing on topics of interest to pets. 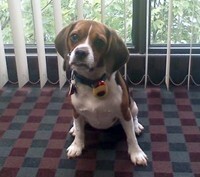 Mr. Meisner is a member of PETA, supports beaglefreedomproject.org, and the Michigan Humane Society.